Due to its athletic, mental and technical demands, Olympic weightlifting is considered to be one of the most admirable sports. 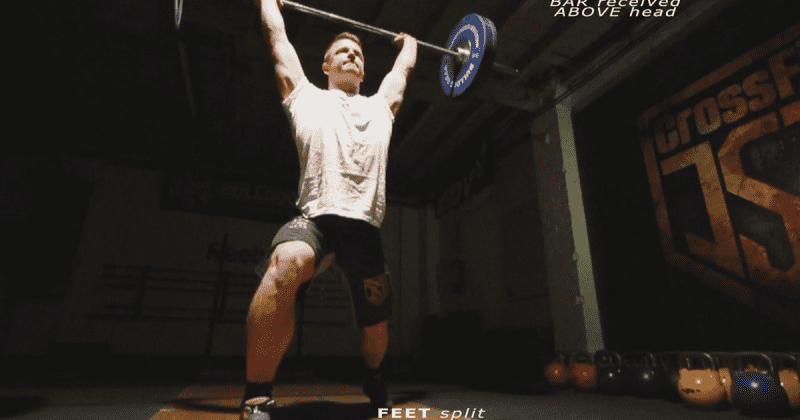 The Clean and Jerk is a cornerstone of this discipline, and features heavily within Crossfit. What makes this sport even more unique is the fact that competitors train for years just for a few seconds of performance: 3 attempts for each lift. Although it`s about moving a huge amount of weight, Olympic weightlifting still appears to look graceful when done to perfection. 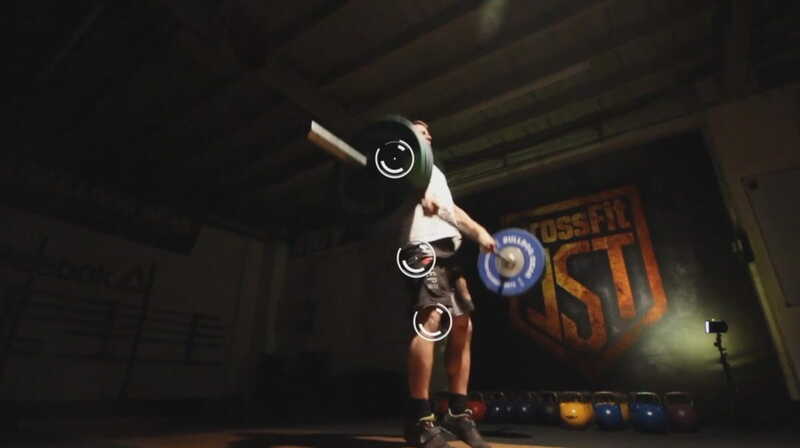 IN Crossfit, the Clean and Jerk is a cornerstone Barbell exercise that demands your time and dedication. The Clean and jerk consists of two parts: clean – from the ground to shoulders, and jerk – from shoulders to above the head. The following How-To is presented together with our friends from Scitec Nutrition. 1. Position your feet in a shoulder width. Grab the bar just past the shoulder width. Keep your back straight. 2. Align the bar over the balls of your toes. Drop your hips so your shoulders are directly above the barbell. Engage core. Pull your head up, look straight ahead and keep your arms straight. 3. Start lifting the barbell. Push the feet against the floor. Keep your core engaged. 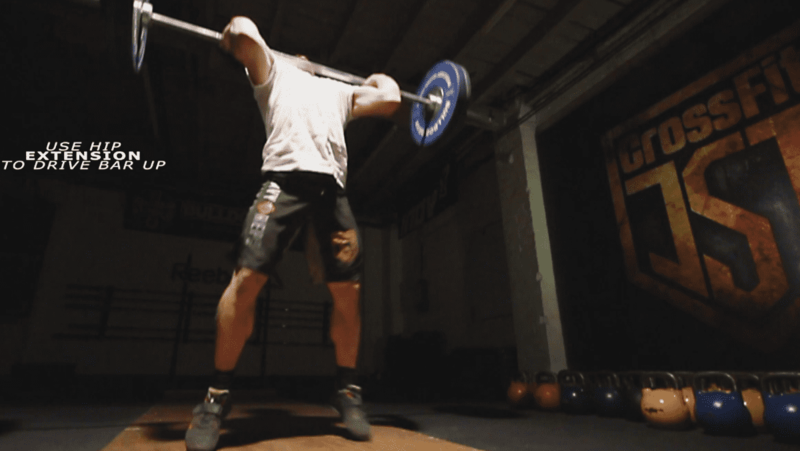 As the barbell passes the knees, pull it back towards your legs. Stay connected to it, keep it close to the body. Keep your arms straight and midline tight. 4. Lift starts slowly and accelerates (after it passes the knees) into a quick, explosive movement and full-body extension. 5. When you lift the barbell to the mid/upper tight, explosively extend your hips. Shrug your shoulders, elbows should be bend outward. Aim to keep the bar close to the body as much as possible. Your goal should be a full hip extension. 6. Shrug your shoulders, pull your body underneath into the front squat position to receive the bar on your shoulders. Lift your elbows up, push your shoulder forwards and slightly up. Stand up. 7. 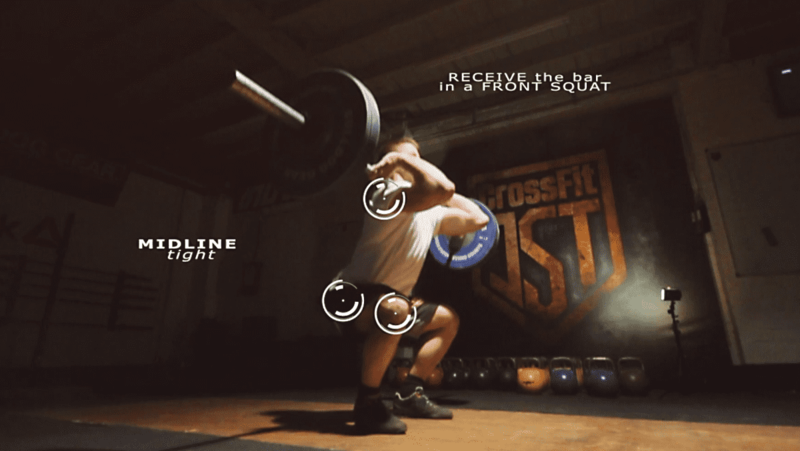 After standing up from the front squat, adjust the barbell into the jerk rack position. Recover, breathe and align your balance towards the heels. Bend in your knees and hips, keep your torso straight. Explosively extend and drive from the ground to thrust the bar upwards above the head. 8. 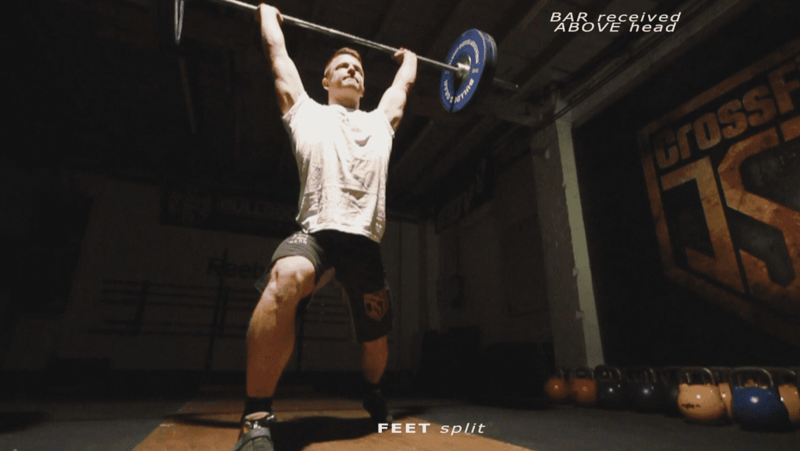 Feet split, elbows are locked, core is engaged and the bar is received overhead. Recover to a full standing position.